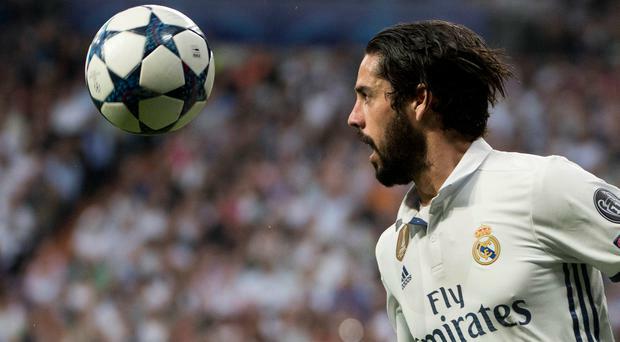 Real Madrid's midfielder Isco has been linked with a move to Liverpool. Liverpool have been linked with three of European football's top midfield stars as transfer rumour silly season gets under way following the closing of the January window. First of all and seemingly most realistically, the Reds have again been named in relation to a move for Monaco's THOMAS LEMAR. That comes after he turned down a new contract at his current club, according to the Independent. The paper says Jurgen Klopp had wanted to bring in the winger this January, but the French side did not want to let him go in the middle of a season. But his unwillingness to sign a new deal at Monaco could open the door for Liverpool to return with a bid in the summer, the paper adds. Moving on to the next most relaistic target in the shape of Real madrid's ISCO. Spanish publication AS has claimed that Zinedine Zidane is prepared to let the 25-year-old leave Los Blancos this summer, leading to the Daily Mirror surmising that the Reds could be tempted to make a move, calling the Anfield club 'reportedly keen'. Diario Gol, however, says the midfielder has attracted the interest of Manchester United, Manchester City and Chelsea. And now, the real pearler, Liverpool have bid a stunning £131 million for Isco's Real Madrid team-mate MARCO ASENSIO, according to Spanish rumour-lovers Don Balon. The report, however, claims that the player would prefer a move to Chelsea. Meanwhile, Manchester United are reportedly preparing a £45million bid for Monaco star Fabinho. The Sun says reports in Italy suggest Jose Mourinho will step-up their pursuit of the 24-year-old wing-back at the end of the season. Luke Shaw is in line for a new long-term deal with Manchester United, the Mirror reports. The paper says the England full-back appears to have won over Jose Mourinho after a turbulent few years. The 22-year-old has impressed in recent weeks and the club are looking to tie him down on improved terms, it adds. Manchester City are ready to turn their back on Leicester City's Riyad Mahrez for good, according to the Mirror. The club bid £60million for the star last month but the deal collapsed and Mahrez has since been absent from the Foxes' training and matches. Blues boss Pep Guardiola is said to have major concerns at the way Mahrez has dealt with the fall-out and will now look elsewhere, the paper reports. Former Barcelona boss Luis Enrique, who has been touted as a potential replacement for Chelsea's Antonio Conte, is preparing himself for a move to England, according to the Telegraph. The paper says allies have confirmed that he wants to return to management in the Premier League. Ainsley Maitland-Neal: Arsenal are in talks with the 20-year-old over a new deal, according to ESPN. The site says the club want to secure his future and reward him for his impressive performances this season with a new long-term contract.